The main vehicle entrance is from Liberty Av across from the Hilton Hotel. Another entrance is at the Blvd of the Allies across from the Post-Gazette Building. There are pedestrian walkways at both locations. 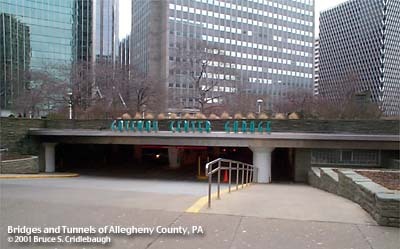 A stairwell provides a connection to the Gateway Center plaza on the west side of Gateway Four near the northern end of the pedestrian bridge over Blvd of the Allies. Access to the other buildings of Gateway Center across Liberty Av is gained from a doorway just inside the Liberty Av vehicle entrance. The development of Gateway Center occurred in two phases: the buildings around Gateway Plaza, north of Liberty Av, 1950-55; the buildings around Equitable Plaza, south of Liberty Av, 1955-1968. The Equitable Life Assurance Company was the major corporate sponsor of the redevelopment initiative. Recently the signs in the area have been changed to "Trizec Hahn Plaza at Gateway Center." view page - More information about Gateway Center.